Saga Furs, one of the most prominent bodies of the global fur trade, has posted its financial report and has recorded a ‘clearly negative’ operating result. 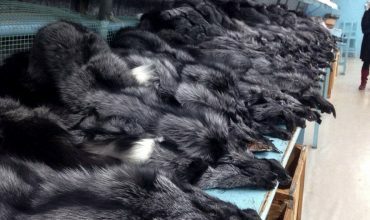 According to Saga Furs latest financial statement, the company’s total sales fell by 28% on the previous year, as the price level of mink skins fell by 24% and fox skins fell by 20%. World mink production is also estimated to have fallen by 20 per cent in 2018. Comparing the most recent financial statistics with those exactly five years ago, Respect for Animals can reveal the extent of Saga’s problems. In the period between November 2012 to October 2013, the operating profit before taxes was 26.7 million Euros. In the period between November 2017 and October 2018 the profit before taxes was negative: -1.7 million Euros. Net turnover had also collapsed from 70.2 million Euros to 45.7 million Euros, while earnings per share went from 5.57 Euros to -0.43 Euros. In a further humiliation for an industry described by Respect for Animals campaigns director, Mark Glover, as ‘morally bankrupt’, the company has been forced to admit that the fur industry ‘faces image problems in the western market’. Saga also offered a further embarrassing excuse for their financial problems by appearing to blame the media, because it had ‘raised fashion house announcements about ending the use of fur’. 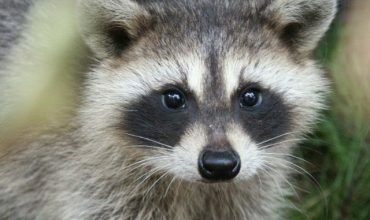 To blame the media for covering the news that fashion giants such as Gucci, Versace, Michael Kors, Jimmy Choo and multiple others are ditching fur smacks of desperation. Another cause for the profit collapse has been identified as a slowdown in China, a key developing market for the fur trade. However, parts of the financial report will sicken those who care about animal welfare and animals who suffer at the hands of the fur trade. The number of pelts sold during the 12 months between November 2017 and October 2018 was over 9.3 million. This shocking number is actually a rise on the number recorded five years previously between November 2012 to October 2013,when 9.1 million pelts were sold by Saga Furs. The collapse of the economic value of a pelt is shown by the fact that total sale of these pelts was valued at 8.9 million Euros five years ago, but only raised 3.1 million Euros in the most recent results. Mark Glover said: “This is another bad news story for the morally bankrupt fur industry, of which Saga Furs is one of the most notorious members. As Chief Executive of the International Fur Federation and former disgraced British politician, Mark Oaten deserves a big pay rise for overseeing one of the most disastrous phases for the fur trade for many years. The excuses offered by Saga Furs for their poor results show that the anti-fur campaign has this multi-billion dollar industry on the run. Further news emerged after the publication of the Saga statistics, which further sheds light on the financial problems for the fur industry. Kopenhagen Furs, the world’s largest fur auction house and owned by Danish fur breeders, has just ended its first fur auction of 2019, recording an average price of 160 Danish Kroner (£19 or $24.5). This suggests a serious economic outlook for the fur industry, given that skin must sell for around 300 Kroner (£35 or $46) for a fur breeder to break even. The graph below suggests that world production of mink pelts is expected to come down from roughly 90 million animals in 2013 to around 37 million this year, with a particularly large drop in Chinese production (down from 40 million to 7 million). In Denmark, the biggest producer, it is expected that 30% fewer animals will be bred this year, going from 17 million to 12 million in one year. You can see this in context graph at the end of this document: https://www.kopenhagenfur.com/media/319471/kopenhagen-fur-indleder-aarets-salg-med-lille-auktio1.pdf. The blue column is world production of mink skins without China and the orange one is China. The financial results are a massive blow to the fur industry. 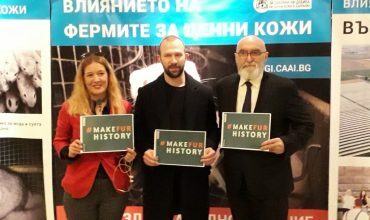 While public opposition to fur production has grown rapidly in many other European countries, countries like Denmark and Finland are amongst the few remaining strongholds of the fur industry in Western Europe. Even in these places the fur trade is under pressure, bringing hope to anti-fur activists everywhere. Saga Furs is a fur brand and fur auction house specializing in selling fur from Nordic countries and owned by the Finnish fur industry. A 2015 report by Scandinavian animal advocacy groups Animalia and NOAH detailed the shocking truth about animal welfare problems and negative environmental impacts that make a mockery of Saga Furs’ claims of ‘ethical fur’ and ‘sustainability’. Sign our letter to the Finnish Ambassador calling for an end to fur factory farming, which is breeding shockingly obese foxes in Finland.